Air tightness testing is a recognised method of measuring the extent to which air is lost through leaks in the building fabric. It is sometimes referred to as air leakage testing or air pressure testing. Air leakage is the uncontrolled flow of air through gaps and cracks in the fabric (often referred to as infiltration or draughts) and not ventilation, which is the controlled flow of air in and out of the building. Too much air leakage leads to unnecessary heat loss and discomfort for the occupants. As the Government strives to reduce CO2 emissions from new buildings, building regulations now place greater emphasis on the quality of the fabric of the building. 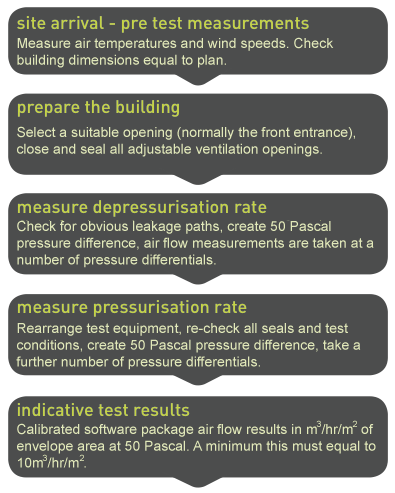 How is the Air Tightness Testing done? 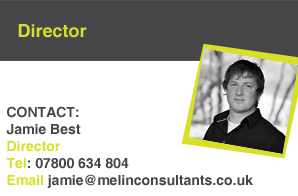 Melin have three qualified engineers, the most for any independent testing organisation in the UK. All testing is completed under the strict methods prescribed by ATTMA (Air Tightness Testing Measurement Association) technical guidelines. In a nutshell a fan or a number of fans are installed to a suitable external opening and the entire building is pressurised over a range of pressure difference. Before we arrive on site though it’s important for us to accurately calculate the building external envelope to reflect the conditioned space within the completed building. The testing is measured in air flow m3 over an average hour period at an average of 50Pa for every m2 of building fabric. Sound complicated? Try this - a typical large detached house would have around 400m2 of exposed fabric on the floor, walls and roof. A test figure of 10 would give 4000m3 of leakage at 50Pa over an hour period or as an equation 10 m3.hr.m2@50Pa.Quite a lot of leakage we think you will agree!! Before the test is carried out, passive ventilation must be temporarily sealed. HVAC plant is switched of and temporarily sealed. The exterior envelope and all its openings are closed. Internally all doors are temporarily fixed open. Drainage traps should be filled. Site workers can remain in the building during the test, or will have to remain outside until the test is complete. There are no health risks to site workers who remain in the building during the test; however there may be some discomfort from the fan noise. When is the Air Test needed? To meet the minimum standards set out in Approved Document L1A, on each domestic development an air pressure test should be carried out on three units of each dwelling type or 50% of all instances of that dwelling type, whichever is less. This chart explains the frequency. Approved Document L2A requires all non-domestic buildings over 500m2 to be tested. The actual test results need to be better than the estimated figure specified in the design SAP or SBEM. There is an exemption for testing smaller sites and non-domestic building less than 500m2, however this automatically triggers a higher values of 15 – and to be honest getting a building compliant with this higher figure is now near impossible!! Having your building air tested need not be hassle. At Melin we like to be involved with projects as early as possible to ensure no hiccups on test day. This means access to engineers during the design and build phases to ensure there is a continuity of air barrier and reducing the chances of a fail due to repeating defects. Melin provide technical assistance at design stage with detailing work, tool-box talks during the early construction phases and thorough audits during the later build phases. This focus at an early stage gives our clients an overall success rate at over 99%. In fact 87% of the buildings we test pass first time – a record we are sure reflects our contribution in the early stages. Whatever stage the project is at we would love for you to get in touch with Melin Consultants.